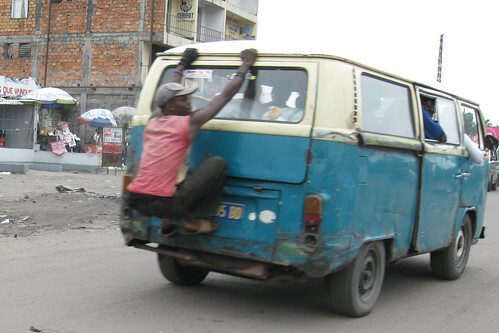 Hawking seats in a VW taxi by the roadside in Kinshasa. Every trip from Njili airport to our Kinshasa home, I have a rush of sweetest memories. Through the eye- smarting diesel fumes of Masina , the view is VW buses zipping through the traffic or hawking for passengers on the side of the road. One of those 4-wheel classics just might be the shiney box my father drove in the 1960s making us the first family on that block of suburban Buffalo, New York, to dump chrome fins for toaster-chic efficiency. 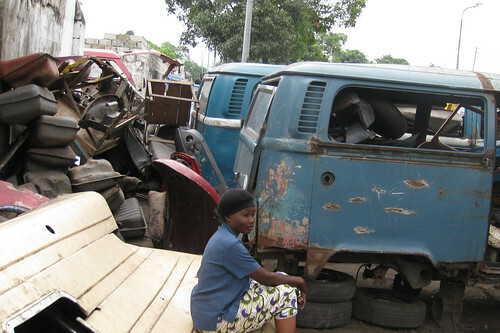 VW boxes eventually junked in the G7 were reborn in Kinshasa, now perhaps the global capital for VW recycling. A hawker ducks out of sight of the gen d’arme (cop) from his official post on the back of his boss’s taxi-bus. 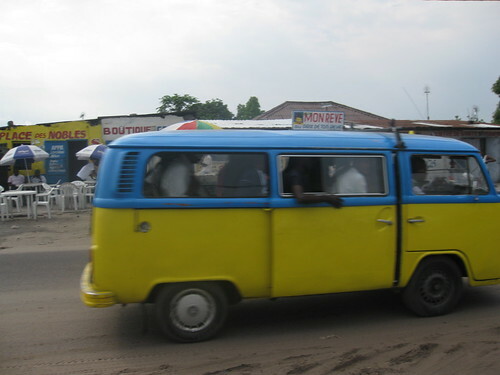 Michel, a Kin-chauffeur who knows everything automotive about Kinshasa, tells me there are now a minimum of 1000 reborn VW buses in KIN. 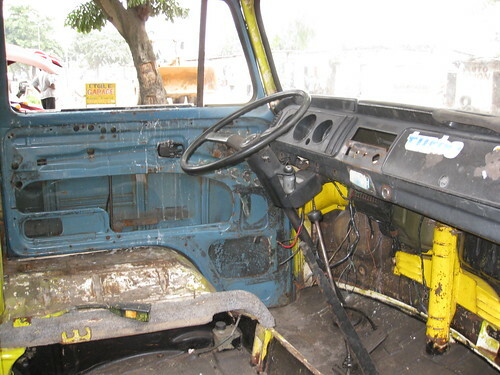 Their second life is as taxi in Kin’s borough of Masina. 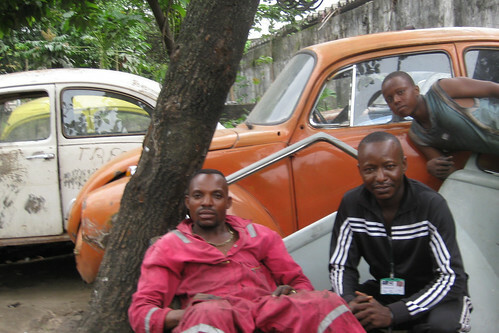 Saint Boni,in red with gold necklace, is chief mechanic at the Kin garage specializing in VWs. Michel poses at his side. 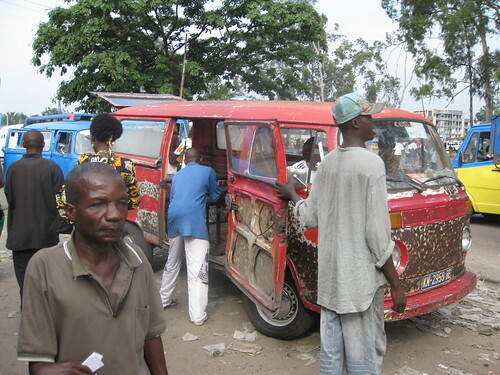 Kinshasa has, of course, the premier operating theater for complete VW make-over. Michel made sure I saw it. Lined up for complete make-over. Lots of spare parts and lots of potential. The height of class is to come out on the road in official national colors. This entry was written by Terese Hart, posted on 2009-01-17 at 8:06 pm, filed under Kinshasa, uncategorized. Bookmark the permalink. Follow any comments here with the RSS feed for this post. Post a comment or leave a trackback: Trackback URL. My friend from Congo, Pleease I need to get vw beetle marathon rims am ready to pay for them brought to Nairobi Kenya. I need two pieces, since i have three. I remember getting on a larger bus in Kin going to Limete. They gave out bus tickets – which were printed with cards with the words: ‘Mike’s Disco’ (in English) printed on them. First stop after collecting the fares was the petrol station. Tickets were collected in again as you left the bus, so they could be used by the next passengers.